← Trent Reznor & Atticus Ross’ “Girl With The Dragon Tattoo” to be housed in a six vinyl package. How To Destroy Angels contribute to soundtrack & start mixing album. UPDATE: CLICK HERE TO BE TAKEN TO WHAT THE ANNOUNCEMENT WAS! 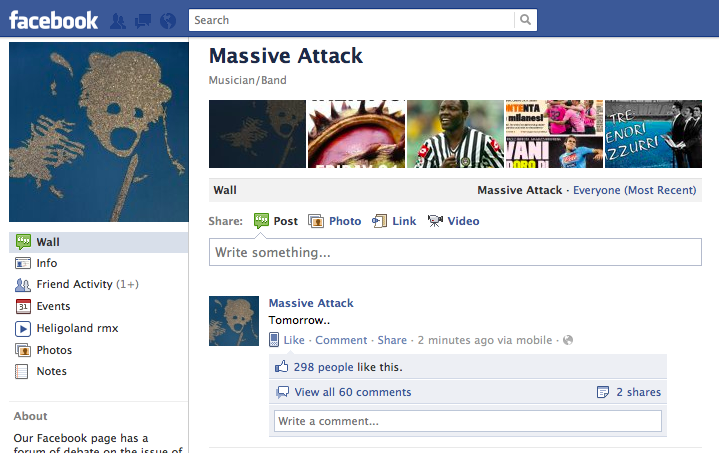 We don’t know what this is about, but Massive Attack have literally just posted a Facebook update stating nothing but the word “Tomorrow” with two dots after it. …And their official website is running a bit slow. Guesses are completely up in the air from the awaited digital release of the “Four Walls/Paradise Circus” project the band worked on with dubstep pioneer Burial, an official release of the demo 3D & Vermona mysteriously uploaded to a Soundcloud account under the user name Euan Me, or completely new material. Our hope is for option 3 or something equally as awesome. 24 hours later.. can’t get here fast enough. Who do these guys think they are by keeping us mysteriously in the dark and anxiously awaiting new material by announcing things like this!? Nine Inch Nails!? Follow 2020k on our Facebook or Twitter to be alerted as soon as this announcement is made! This entry was posted in Sine Wave and tagged Burial, massive attack. Bookmark the permalink. Didn’t Burial pull this with his album Untrue? I remember reading somewhere that he posted “TWO WEEKS” on some website, two weeks before Untrue was released. Googled for a couple of minutes and couldn’t find any confirmation on that, but it wouldn’t surprise me. I’ll add him to the list of people who have mastered the art of “spur of the moment” marketing and releasing of records. What is going on? Tour dates ?